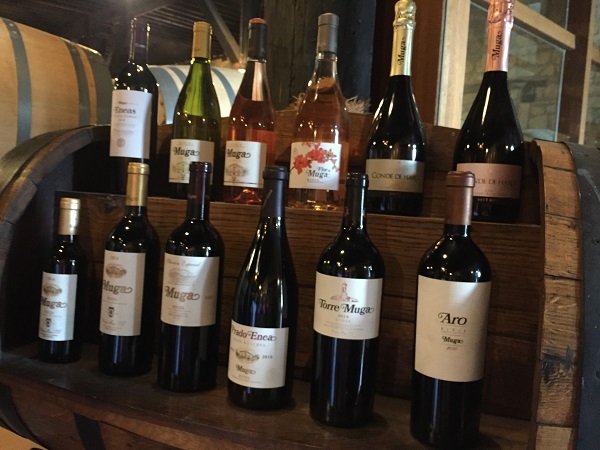 The first time we visited Haro, we were not able to book into Bodegas Muga. Therefore, the first thing we did before the 2018 IMW Symposium in Logroño to go back to Haro, for Muga. 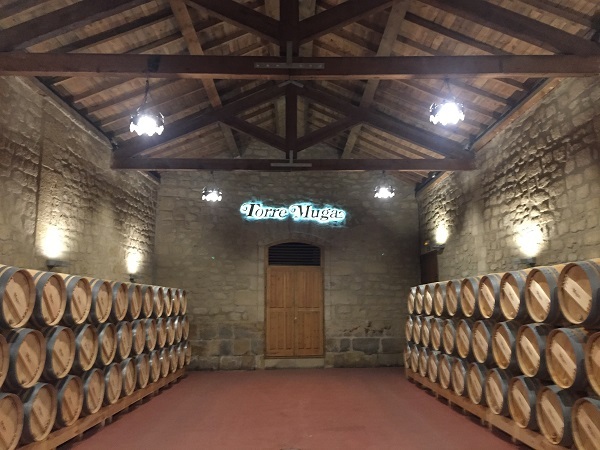 After a tour of the winery, Ruth and I were joined by Manu Muga and Isaac Muga Palacín for a sit-down tasting that ended-up encompassing not only their full range, but also a fantastic, traditionally-styled Rioja Blanco…from 1973. 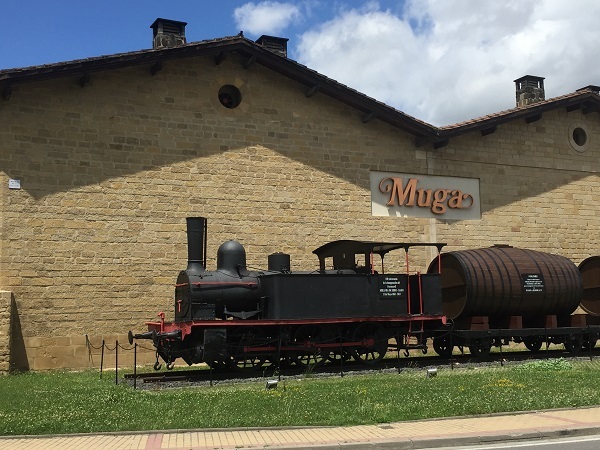 The Muga winery was established in the famous Barrio de la Estación area of Haro in 1932, by the 3rd generation of the family, when the original building known as Prado Enea was acquired from the Prado family. The prior two generations had been grape growers who simply sold to big houses. A further 2 and 3 generations have since taken over the running of the family-owned business, including siblings Jorge, Isabelle and Manu. This makes Muga one of the Big 5 of the Barrio district alongside next-door neighbours La Rioja Alta, Lopez de Heredia-Viña Tondonia across the road, Roda further up and CVNE just around the corner. Muga own vineyards only in Rioja Alta, all within 25km of the winery, in the valleys of the Tirón and Oja tributaries, rather than the larger Ebro. 300Ha vineyards are either owned or held under long-term contracts. Tempranillo is king, but Garnacha, Mazuelo, Graciano red vines, plus Viura, Garnacha Blanca and Malvasía whites, are also planted. The winery was originally built from stone to keep the winery and storage facilities naturally cool and wood is used throughout. That philosophy has been continued as the winery has grown, blending stone and wood tradition with modern design and technology touches. 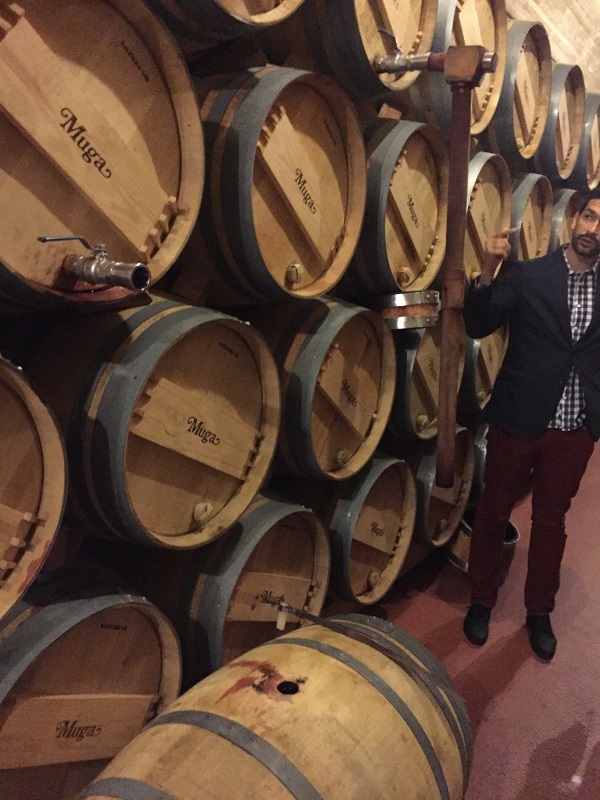 The use of wood extends to both fermentation vessels and barrels for maturation, with Muga being the only bodega that employs a full-time team of 3 coopers not only to mend existing barrels – as the likes of Lopez de Heredia do – but also to make a substantial proportion of the new barrels and vats Muga use. The barrel cellar holds up to 14,000 barriques, with the in-house cooperage making 6-700 new barrels each year, or around 60% of requirements. 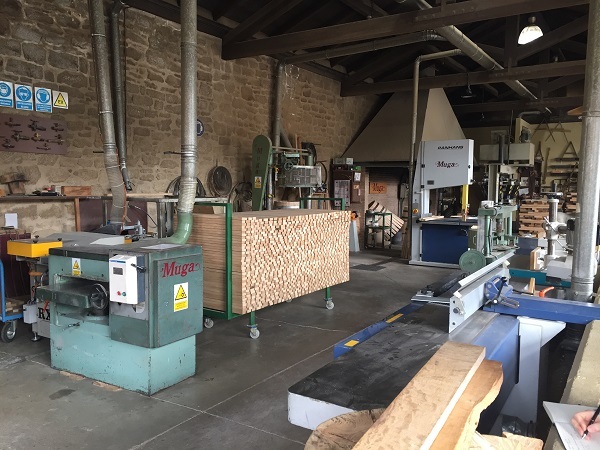 French oak trees are selected every 4-5 years from a range of forests including Nevers, Allier, Vosges and Tronçais and seasoned by Muga for 2-3 years before use. Toasting is done over oak-wood fires mainly to M or M+ toasts, but higher toast for Torre Muga barrels. Maturation is primarily in French oak, with some American, and some trials with Hungarian oak currently underway. 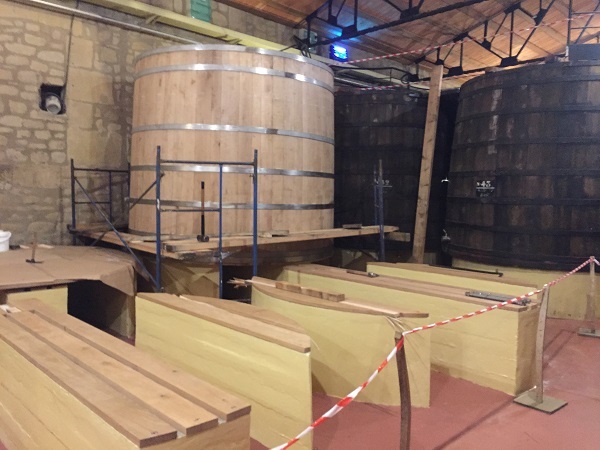 Fermentation is in old oak vats averaging 30-40 years of age and up to 80 years, with the cooperage team currently building a new set of 4 large vats. Vats are of varying sizes to allow plot-by-plot or village-by-village vinifications. Malo-lactic fermentation takes place in barrels, in a cool cellar, followed by up to 3 years’ barrel age. Barrels are racked by gravity every 5-6 months. Wines are egg-white fined (4-500 whites per tank) and settled for 6-8 weeks to clarify. For me, one of Muga’s biggest strengths is a willingness to craft wines that work well in both the ‘classical’ Rioja style and the ‘modern’ – at least inasmuch as the style that emerged in the 1990s can be called ‘modern’. For ‘classic’ wines, exemplified by their Prado Enea Gran Reserva made since 1969, they look for fruit from higher altitudes to give more acidity and crisper fruit. By contrast, ‘modern’ Torre Muga launched in 1991 is built around warmer, riper fruit. 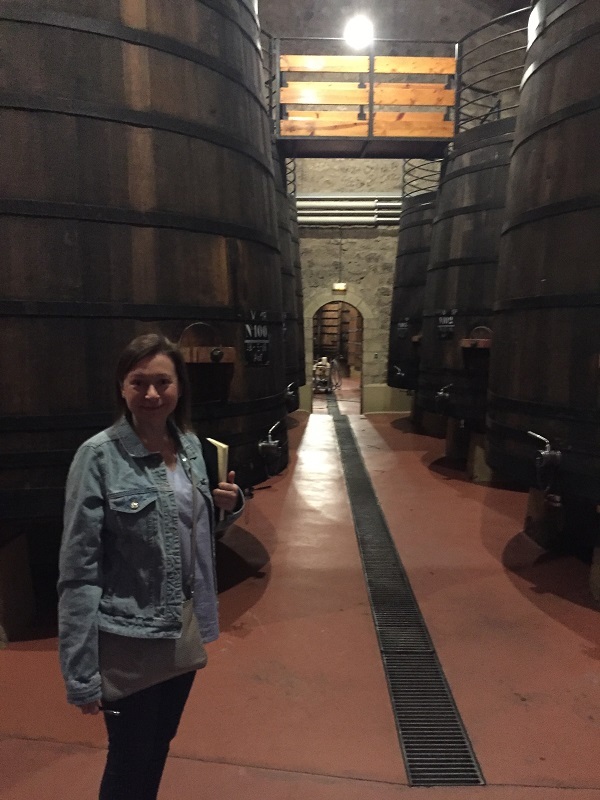 Interestingly, as they pull back on small and new oak for their (modern) barrel fermented Blanco, they are also looking at a second Rioja Blanco in a more traditional style – again showing preparedness to embrace all styles. A further strength is their capacity to make such wines with a clearly high level of quality and at substantial quantities. Whilst their rarest wine, Aro, made only in top vintages like 2010 is only 4-5,000 bottles – which is easy (or easier) to make well, total production is 1.5-1.8m bottles. Delivering a well-crafted Reserva (labelled Crianza in Spain, though it qualifies as a Reserva) at many thousands of bottles is much harder. As the tasting notes below made during the visit, supplemented by those taken at ProWein, clearly demonstrate. 2017 was hit by the April frost, meaning small production but quality is OK. Historically, this wine was 100% barrique fermented in new French oak, but now has moved to 60% barriques and 40% large oak vats, to bring more fruit. The barrique proportion remains new but for a total of just 2.5 months’ total time including fermentation and maturation. This is intended to bring out more of the fruit component earlier. Blocked malolactic delivers freshness, but has battonage twice a week to give roundness. 90% Viura, 5% Malvasia and 5% Garnacha Blanca. The blending components both add aromatic lift to neutral Viura and the Garnacha Blanca some volume. Garnacha Blanca gives finesse and integrates oak well when fermented in larger oak. Malvasía is best from southern Rioja. Experimenting with Maturana Blanca which Isaac thinks can be more concentrated and powerful than Garnacha Blanca, if harvested with at least 14% potential alcohol. With experimental plantings when the varieties were authorised, Isaac quickly found that neither Verdejo nor Sauvignon Blanc work in Rioja – too cool for Verdejo and the Sauvignon Blanc is just unexciting, so have grafted these plots over already. A traditional Reserva was made until 1990, when difficulty commercialising it led to its demise. However a second white will be added in a similar vein to the addition of the Flor de Muga Rosado as a different style to the main Rosado. Tasted at ProWein 2018. 90% Viura, 10% Malvasia. 8-hour press maceration. Barrel fermentation in new French oak, with 3 months on lees. P: Brisk acidity with ripe pear, melon and white peach. Spicy oak on mid-palate and finish. Made since the 1980s to honour their grandfather. The colour has been traditionally pale, not designed to meet recent fashion trends, and used to be a hard sell as it was much paler than previously-fashionable styles like Navarra rosados. 60% Garnacha and almost 40% Viura, with a touch of Tempranillo for colour. Garnacha is from higher altitudes and harvested in early-September to give freshness as well as low colour. 4-hour skin maceration precedes wood cask fermentation. 4 months on lees. Tasted at ProWein 2018. 60% Grenache, 30% Viura, 10% Tempranillo. P: Chalky texture and flint mineral to melon and subtle hints of strawberry. Sweet apple. Low temperature fermentation feel – turns out it was a 25-day fermentation! Pure Garnacha from small parcels at altitudes over 600m in the Valle Najaria. Free-run juice only – ‘flor’ juice. Fermented in new 500L and 600L French oak tonneaux. 5 months on lees. Looking for volume and minerality, in a pale, ‘Provence’ style – hence pure Garnacha. 20,000 bottles a year and expansion will require finding good enough quality, old vine Garnacha. Short but beautiful vintage in Rioja Alta. Weather was bad till mid-September but then improved, leading to a typical harvest in mid-October, picked in good conditions. Indigenous yeast fermentation and aim for 10-12 day fermentation and maceration. Indigenous bacteria MLF. 75% American oak, with older barrels and matured for 22 months. 1994 was a watershed year when the company focused on quality and brought together the Crianza and Reserva in the same bottle but for different markets. Labelled as Crianza in Spain as consumers expect to find a Crianza in Rioja producers’ line-ups, but Reserva internationally. Tasted at ProWein 2018. Labelled Crianza in Spain. 2 years oak and 1 year in bottle. 70% Tempranillo, 20% Grenache, 10% Graciano & Mazuelo. To be released later in 2018. In 2017, the frost affected vintage resulted in crops from 3rd budding that had to ripen over a shortened season, meaning not good enough to produce Prado Enea, Torre Muga or Aro. Some blocks were good enough so a Selección Especial 2017 will be made – although the large amount of extra vineyard work coupled with tiny yields meant a production cost 4-5 times higher at €4.50 / kg fruit vs. €0.75-1 / kg typically. Fruit selection is done in the vineyard, but selection also extends to better choices of oak barrels. 100% French oak; 50% new. UK is the best market for this, retailing at £20-25 in Majestic and a selection of Waitrose stores. New style of Rioja Reserva. Refrigerate trucks to hold grapes at a low temperature for 24 hours before fermentation. Fermentation starts cool, but with only a little temperature control, so steadily rises to 30-31C and finishes warm – to add complexity, Isaac believes. 30 months in oak, but made in a young, fresh style. 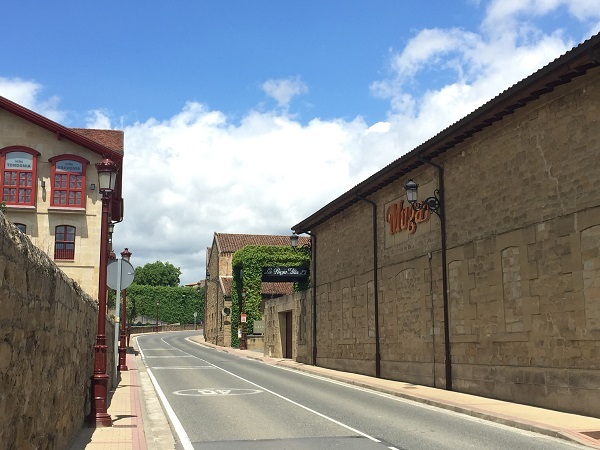 Enea means ‘home’ in Basque, hence the name the Prado family gave the original winery building. 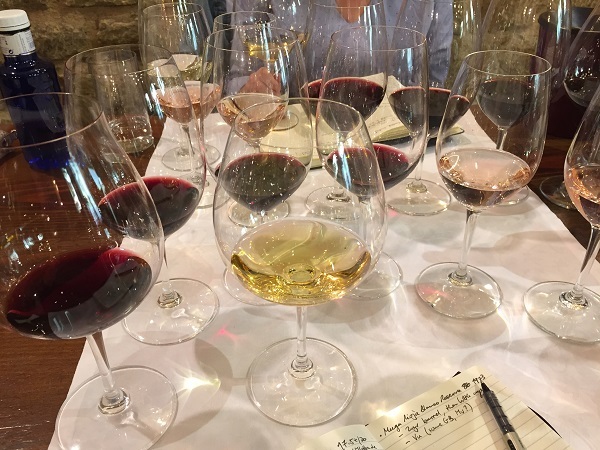 Different grape sources – Villalba de Rioja vs Haro for Prado Enea – to give richness. 16-18 months in 100% new, French oak (Jupille, Loir, Allier and Tronçais), M+ toast but toasted long at <200C to give fine aromatics so the wood does not dominate. 18 months ageing only in the very top vintages. Unlabelled. 2 years in barrel then bottle aged. Viura, perhaps with some Garnacha Blanca and Malvasía? 70% Viura, 30% Chardonnay. Chardonnay planted in 2000 only for Cava production, to bring complexity to the blend. 1.5 g/L RS. 30 months on lees. 50,000 bottles. Only 5 wineries are authorised to use DO Cava in Rioja, while 2,000Ha were authorised for white grape planting. So, 2 years ago, the Rioja Consejo created a Rioja Sparkling category to absorb the additional white wine production. In future, Muga will use this category for Conde de Haro. 100% Garnacha. pH3.0, 7.5 g/L TA. Same grapes as used for Flor de Muga, but picked a few days earlier. Can press directly to almost white, so naturally a very pale pink colour. 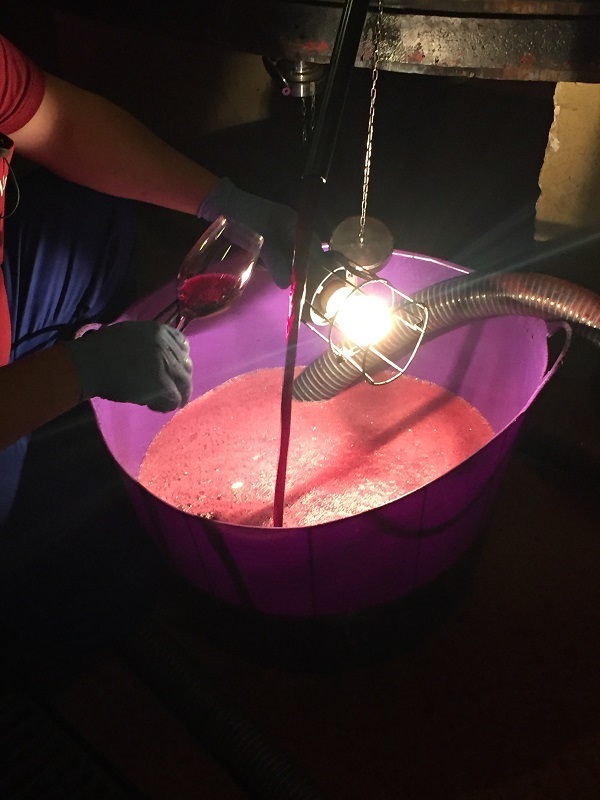 Use micro-oxygenation during fermentation to avoid Garnacha’s reductive tendencies, along with 4 months’ battonage before bottling and second fermentation. Selected yeast for primary and secondary fermentation. 25,000 bottles.